21 Commercial Real Estate & Properties in Woolner are listed in 4 categories. We have 11 OfficesLease , 9 Industrial Warehouses Lease , 2 ShowroomsLease and 1 Retail ShopsLease . This showroom / warehouse unit is part of modern commercial complex in a well located position with great exposure to Bishop Street. Offering 137m2 of air conditioned showroom / office space it has lots of natural light. It is complimented by a rear warehouse of 113m2 plus additional mezzanine storage space. It has its own amenities and kitchenette. The property is readily accessible with seperate entry exit point for easy deliveries. Need even more space, we can combine this with the adjoining unit to give you ultimate corner frontage! Call Martin 0417 850 933 to inspect. Located on the corner of Bishop Street and Damaso Place, your business will stand out in this well presented commercial complex. 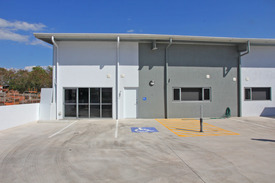 The tenancy provides wrap around office showroom of 129m2, which is fully air conditioned and plenty of natural light. There is additional internal air conditioned office / workshop of 63m3 and warehouse of 89m2. It has mezzanine storage space. The unit has its own amenities including full bathroom. Easy access with seperate entry exit points the warehouse has a roller door and personal access door. Need even more space? We can Combine U 3 and 4 to give you ultimate frontage to Bishop Street. Phone Martin 0419 850 933 to inspect. Modern commercial complex Unit building area 165 sqm approx. Warehouse area approx. 115 sqm 3 partitioned offices on the mezzanine level approx. 50 sqm in area Amenities include kitchenette in the office and toilet in the warehouse Electric roller door access to the warehouse On site parking Ideally located just 6 minutes from Darwin CBD Available now View by Appointment 7 Days! For Lease: $1,600.00 + GST per month For more information, or to arrange an inspection, call Nick Syrimi today at Ray White Commercial (NT) Visit our website rwcnt.com.au to view all our property listings! Modern complex of two warehouse units Warehouse / office total building area 235 m2 Office/showroom approx. 39 m2 Warehouse area approx. 196 m2 Masonry block construction Clear span internally Motorised roller door 3.2 metres wide Kitchenette, disabled W.C + shower combined Concreted driveway and parking area Ready for immediate occupancy View by Appointment 7 Days! For Lease: $2,600.00 + GST per month For more information, or to arrange an inspection, call Nick Syrimi today at Ray White Commercial (NT) Visit our website rwcnt.com.au to view all our property listings! Warehouse total area 258 m2 Including front office area approx. 28 m2 Amenities: Kitchenette Toilet Rear yard area Good access via front roller door and 3 wide opening Sliding doors on the side and rear 3 phase power points installed Car parking directly in front of premises Available to occupy with one months notice View by Appointment 7 Days! For Lease: $2,600 + GST per month For more information, or to arrange an inspection, call Nick Syrimi today at Ray White Commercial (NT) Visit our website rwcnt.com.au to view all our property listings! Conveniently Located Strata Warehouse With Office 1,750 per month (GST not ..
Strata warehouse unit with office Building area approx. 166 m2 1x office approx. 12 m2 area 1x staff room with kitchenette approx. 12 m2 area Masonry block construction 1x motorised heavy duty roller door 3 phase power Parking area directly in front of the premises 15 metres wide Unit entitlement area 248 m2 Convenient industrial location less than 10 minutes from the city View by Appointment 7 Days! For Lease: $1,750.00 + GST per month (GST not applicable) Also available for Sale @ $310,000 (GST not applicable) For more information, or to arrange an inspection, call Nick Syrimi today at Ray White Commercial (NT) Visit our website rwcnt.com.au to view all our property listings! Office tenancy building area 32 m2 Ground level tenancy Masonry construction Ceramic tiled floors Kitchenette plus W.C 1x car park Ready to Occupy View by Appointment 7 Days! THIS PROPERTY HAS BEEN LEASED BY RAY WHITE COMMERCIAL (NT) For more information, or to arrange an inspection, call Nick Syrimi today at Ray White Commercial (NT) Visit our website rwcnt.com.au to view all our property listings! Fully fitted out strata office Total unit area approx. 116 m2 Front section Reception area, plus 2x offices Rear office area open plan Amenities kitchenette, W.C 2 dedicated car parks Convenient location with quick access to freeway Just minutes from the CBD Available for immediate occupancy View by Appointment 7 Days! For Lease: $2,350.00 + GST per month For more information, or to arrange an inspection, call Nick Syrimi today at Ray White Commercial (NT) Visit our website rwcnt.com.au to view all our property listings! 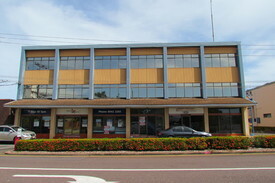 Unit building area 73 m² Fully fitted out internally as 2 separate office areas with kitchenette Shower and toilet at the stairs landing level Disabled toilet (common to complex) next door on ground level 2 under cover car parks Modern Commercial Complex Just 6 minutes from the Darwin CBD View by Appointment 7 Days! THIS PROPERTY HAS BEEN LEASED BY RAY WHITE COMMERCIAL (NT) For more information, or to arrange an inspection, call Nick Syrimi today at Ray White Commercial (NT) Visit our website rwcnt.com.au to view all our property listings! A unique opportunity to lease this clean centrally located office suite. Sure to be popular with its own street frontage, seven individual offices, reception area, open plan area for meetings or further work stations all with air conditioning, kitchenette, male and female toilets and more. Nice looking building with lots of natural light. Perfectly positioned in the main business/ commercial / industrial suburb of Woolner making it extremely convenient to access the CBD, Darwin Airport, Palmerston, East Arms and more. Call Cameron Charles 0438 058 022 to inspect today! Total Unit area 105 m² Showroom / office 40 m² Glazed shop front Fully air conditioned Storage area 65 m² (also air conditioned) Small roller door for rear access 2 dedicated car parks Street front location Available now View by Appointment 7 Days! For Lease: $1,918.00 + GST per month For more information, or to arrange an inspection, call Nick Syrimi today at Ray White Commercial (NT) Visit our website rwcnt.com.au to view all our property listings! Strategically located with proximity to the Darwin CBD, Winnellie, and the Northern Suburbs, this property offers exceptional accessibility and lots of security. Featuring a quality building comprised of some166.8m2 which includes a dedicated office area with an abundance of natural light, as well as a high clearance warehouse with roller door access, and a solid mezzanine level, this space is sure to suit a variety of uses. There are also exclusive amenities, as well as ample parking available on site. Fully fitted out office Total unit area approx. 116 m² Front section Reception area, plus 2 small offices Amenities, kitchenette, W.C Rear office open plan area 2 dedicated car parks Convenient location with quick access to freeway Just minutes from the CBD Available now View by Appointment 7 Days! For Lease: $2,400.00 + GST per month For more information, or to arrange an inspection, call Nick Syrimi today at Ray White Commercial (NT) Visit our website rwcnt.com.au to view all our property listings! 165sqm Office/warehouse On The Fringe Of The Darwin Cbd $1,250 Net + GST p.m.
Woolner is next to Winnellie only 3 radial kilometres from Darwins CBD. Positioned in between the International Airport and the Port of Darwin with the Stuart Highway along the northern boundary and Tiger Brennan Drive to the South. Woolner offers quick access into the CBD as well as being centrally located to all major transport nodes and the rapidly developing town of Palmerston. Unit 9 at 34 Bishop Street is a combination of besser block office warehouse that is accessed via 2 roller doors and two access doors that go into the warehouse areas. The total internal area is 165 square metres which is made up of 110 square metres on the left hand side and 55 square metres on the right side divided corrugated iron partitioning. The smaller area has a separate power board and electricity metre and also offers 12 square metres of light mezzanine storage area. The larger area has a small air conditioned office area and has a toilet, shower and kitchenette. There is also 83 square metres of land on the title at the font of the unit which can be utilised for parking and/or external storage area. At this price, in this location, this unit so close to town will be snapped up. For more information please contact Shun Hatton on 0414 282 100 at First National Commercial. Vacant open plan office space on 1st floor Great rental price for office minutes from city Good natural light from large windows Fully air conditioned and carpeted throughout Plenty of parking For further information please contact the Agent or Email: darwin@ljhc.com.au.
. Vacant open plan office space on 1st floor . Great rental price for office minutes from city . Good natural light from large windows . Fully air conditioned and carpeted throughout . Plenty of parking For more information or to organise an inspection, please contact the Agent or Email: darwin@ljhc.com.au. Street front unit in New Commercial complex Warehouse area 164m and #xB2; Mezzanine office area 62 m and #xB2; Mezzanine storage area 6.0 m and #xB2; Total building area 232 m and #xB2; 1 x W.C Kitchenette Roller door height approx. 3 metres high x 3.8 metres wide. Under cover parking bays and loading bay Ideal for showroom All uses consideredView by Appointment 7 Days!For Lease: $2,860.00 + GST per annumFor more information, or to arrange an inspection, call Nick Syrimi today at Ray White Commercial (NT)Visit our website rwcnt.com.au to view all our property listings! Total Unit area 105 m and #xB2; Showroom / office 40 m and #xB2; Glazed shop front Fully air conditioned Storage area 65 m and #xB2; (also air conditioned) Small roller door for rear access 2 dedicated car parks Street front location Available early DecemberView by Appointment 7 Days!For Lease: $1,918.00 + GST per monthFor more information, or to arrange an inspection, call Nick Syrimi today at Ray White Commercial (NT)Visit our website rwcnt.com.au to view all our property listings!